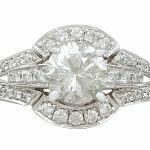 Traditionally diamonds have been renowned as a women’s best friend. 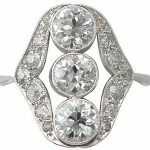 Due to today’s stylistic trends and modern styles however, diamonds for men have become increasingly popular. So with diamonds now being man’s new friend, what diamonds do we have on offer for men at AC Silver? Our exquisite collection caters for whether you’re an eccentric man who likes to showcase big, beautiful diamonds or the kind of gent who appreciates the subtlety of a fashionable diamond; it is said “less is more”. 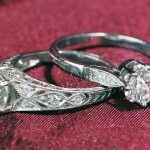 Regarding ring wearing etiquette, traditionally men wear a wedding band or a signet ring . 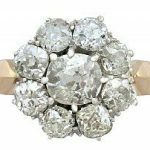 Due to the variety however of precious gemstones and diamonds, it would be a shame to not cater more fashionable and imaginative designs around gents these days. As women have shoes, men have cufflinks. Cufflinks can be argued to be timeless; they will always serve a purpose. The versatility of a cufflink allows a wide range of designs to be applied, showcasing different metals, gemstones and decoration. Men can reflect their personalities through their cufflinks, adding a personal touch to their outfit. 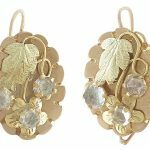 Below is a hand-picked selection of inspirational gemstone and diamond jewellery items for men, starting some with diamond embellished cufflinks. Vintage 1974, Diamond, Emerald and Blue Enamel, Yellow Gold Cufflinks. 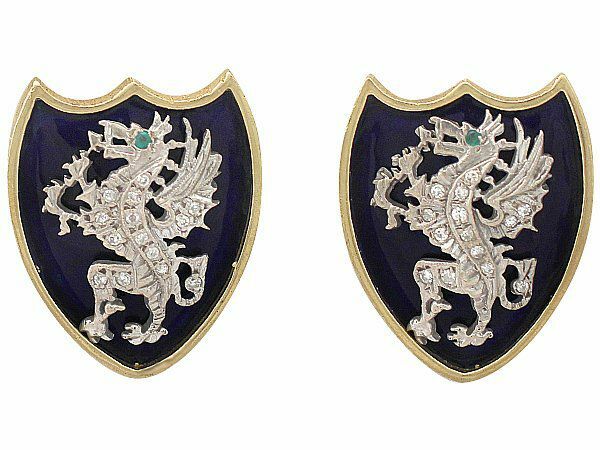 A stunning, fine and impressive pair of vintage 0.35 carat diamond and 0.03 carat natural emerald, enamel and 18 carat yellow gold cufflinks with an 18 carat white gold heraldic dragon motif; part of our diverse collection of English jewellery. Antique French Circa 1930, Diamond, Platinum Set, Rose Gold Cufflinks. 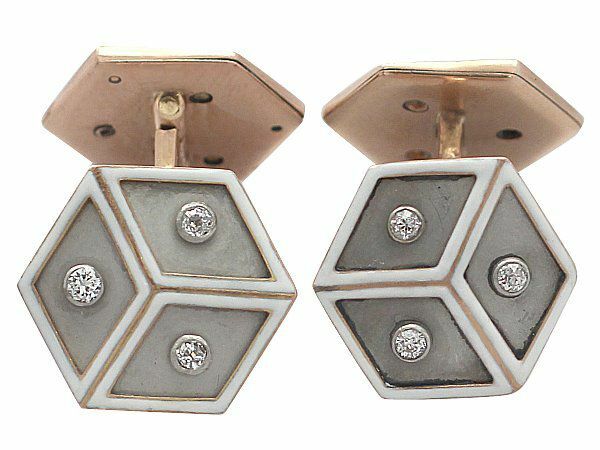 A fine and impressive pair of antique 14 carat rose gold, white enamel, platinum set 0.24 carat diamond cufflinks; part of our diverse collection of French jewellery. Moving away from men only wearing wedding rings, (a plain, gold wedding band on the fourth finger), with seven other empty fingers, we have a selection of rings that would help any guy ‘dress to impress’! 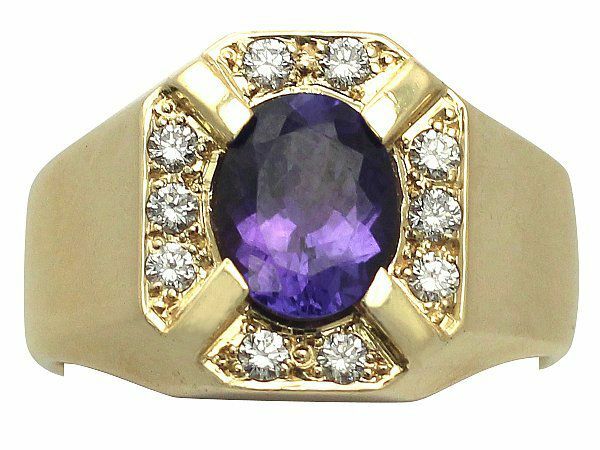 A fine and impressive modern 3.35 carat natural tanzanite and 0.50 carat diamond, 18 carat yellow gold dress ring; part our contemporary jewellery and estate jewellery collections. 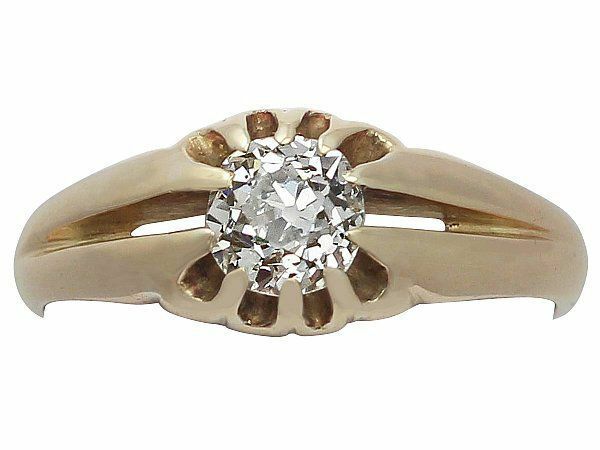 A fine and impressive antique Edwardian 0.93 carat diamond and 18 carat yellow gold solitaire ring; part our antique jewellery and estate jewellery collections. 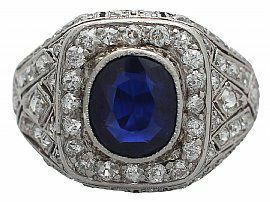 A stunning, fine and impressive antique 1.85 carat sapphire and 1.60 carat diamond, platinum cocktail ring; part of our diverse collection of antique rings. Previous Entry: What is an Argyll?